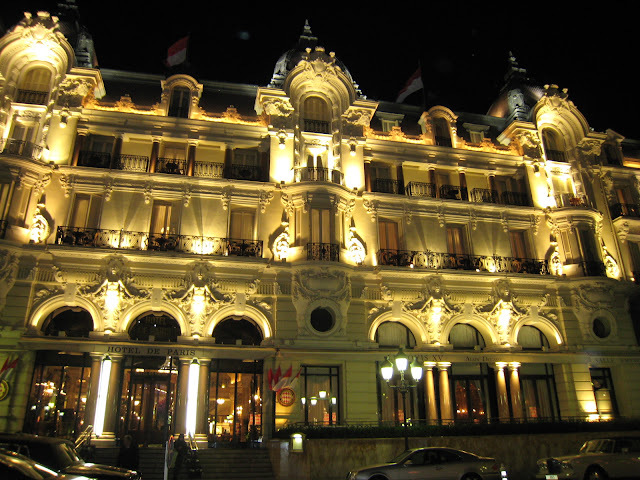 Let's have a glamorous night out in Monte Carlo. Come with me to the Hôtel de Paris. First, we'll take a look around the glorious foyer. Then we'll go into the American Bar - pink champagne? We can listen to the jazz being played on the piano and watch the Beautiful People. Later, we'll eat - perhaps in Le Grill on the 8th floor? So, let's begin. We'll walk up the steps and through the revolving door. Come back tomorrow and I'll show you the bronze horse, so beloved of gamblers - and which stands on a plinth just inside the entrance. OK, I'm on my way - don't leave without me! Think I'll take Monte Carlo. Okay, Jilly, I'm hooked. See you tomorrow. Great night shot with the wonderful lighting on the hotel.